We know that shutter speed and aperture are important part of photography in manual mode. 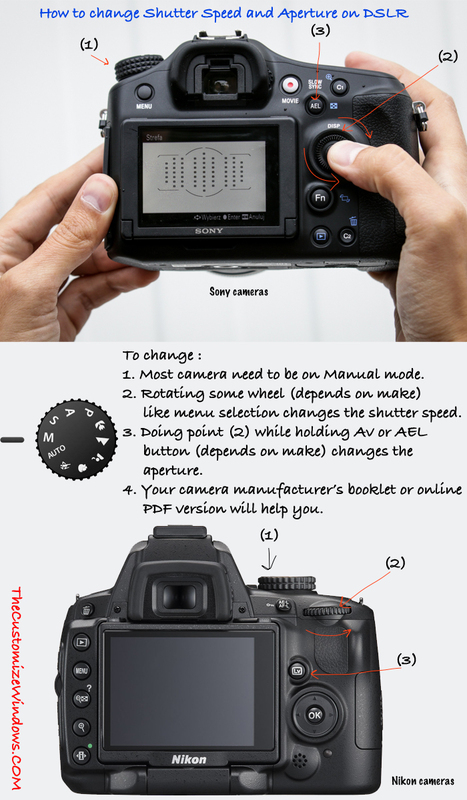 But, how to change shutter speed and aperture on DSLR? Depends on make of camera and lens. You need to rotate some wheel with and without pressing another button is the basic. We have included a graphical representation which can help you. Good cameras have dedicated shutter speed control wheel. These models are somehow made to use. Usually the camera manufacturers and lens manufacturers has booklets. On your camera’s booklet or PDF version of it, you’ll get the actual official method. You’ll find some direction like – “Rotate the control dial to adjust the shutter speed, and while pressing the Av button, rotate the control dial to adjust the aperture”. Also, you can ask on camera’s official forum or other online community for that camera’s brand. Case of Sony (like Sony A68) is easy. That control navigation wheel feels like mechanical wheel and while looking through the viewfinder to compose photograph, it is possible to change the value. Changing aperture is while keeping the eye on viewfinder will need 3 hands! For Nikon to change the shutter speed, you probably need to put the mode dial on mode like Tv, and turn the wheel used for navigation menu. For Canon, Nikon’s APS-C sensor DSLRs, changing while keeping the eyes on viewfinder is meaningless try. Some costly lenses sport with mechanical aperture control ring on lens. As aperture is a physical parameter and camera tries to keep the things easy, with telephoto lenses at maximum extension, aperture control is “specially abled” (same as inhumane word disabled). Also if camera’s lens has physical limit of aperture at 5.6, camera can show to increase to 7. The diaphragm assembly including blades actually never permit such. This Article Has Been Shared 4846 Times! Cite this article as: Abhishek Ghosh, "How To Change Shutter Speed And Aperture on DSLR," in The Customize Windows, July 11, 2017, April 26, 2019, https://thecustomizewindows.com/2017/07/change-shutter-speed-aperture-dslr/.